Sorry, but the original image resolution has been reduced to conserve bandwidth and server space. 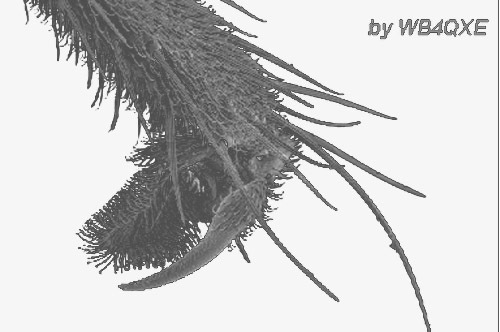 A long time ago, I developed a tutorial about SEM analysis. I believe information found in the tutorial is accurate, but may be slightly behind latest developments. The 4.8MB, PDF file may be downloaded by clicking the thumbnail below. Use your browser BACK button to return. 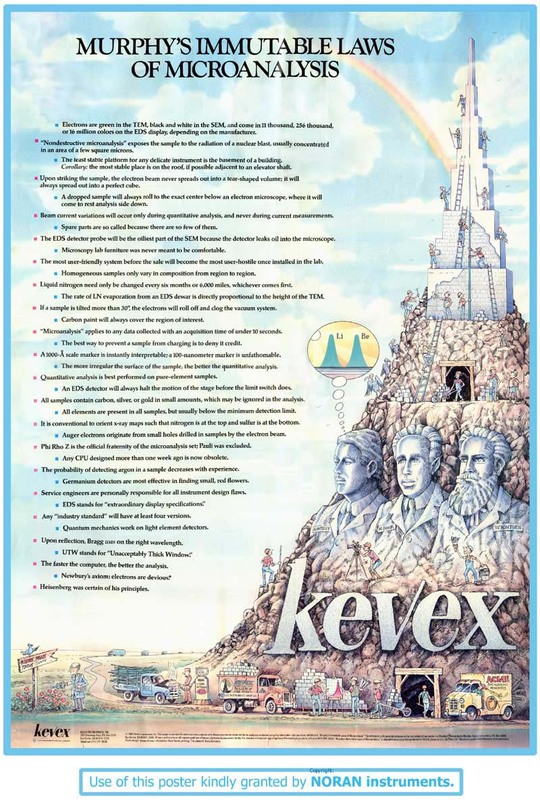 A classic tongue in cheek EDS poster. Click image for 211K Download. ...WARNING! Hi-res download may take quite a while! (tif was 24 Meg). The 2345x3476 pixel jpg is a 723K download. Had to JPG for server room. Suggest right click (here) and save file: For large printable image. 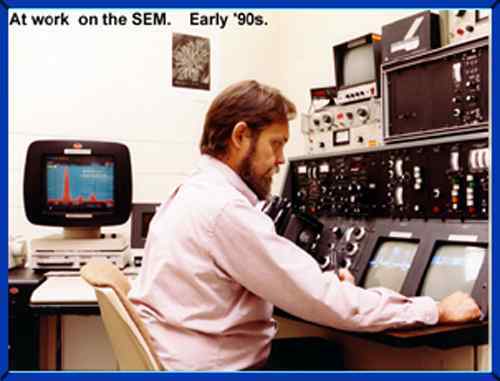 SEM Lab - ETEC AUTOSCAN, early 90s. 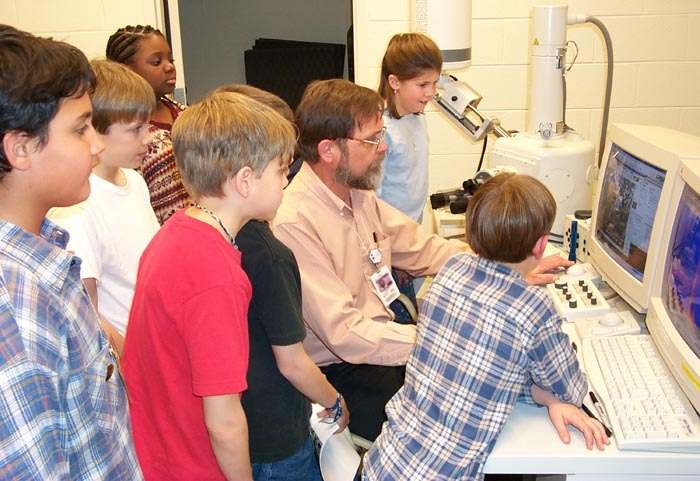 Fourth and Fifth graders visit the lab as part of an after school enrichment series. The S-3500H is being installed at this time. 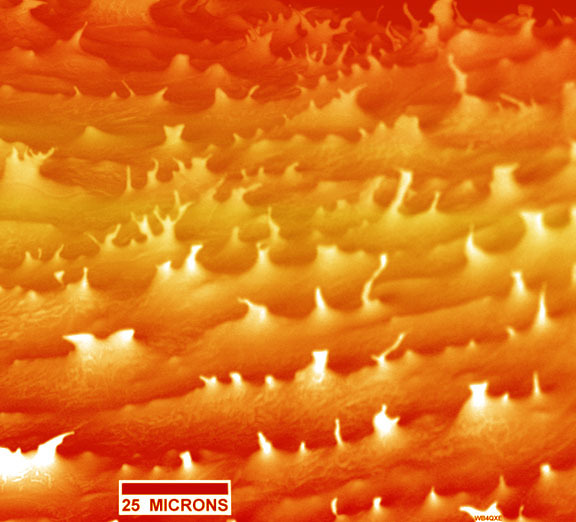 "Incandescent Ni / W" PseudoColored SEM image. Balance are GrayScale. 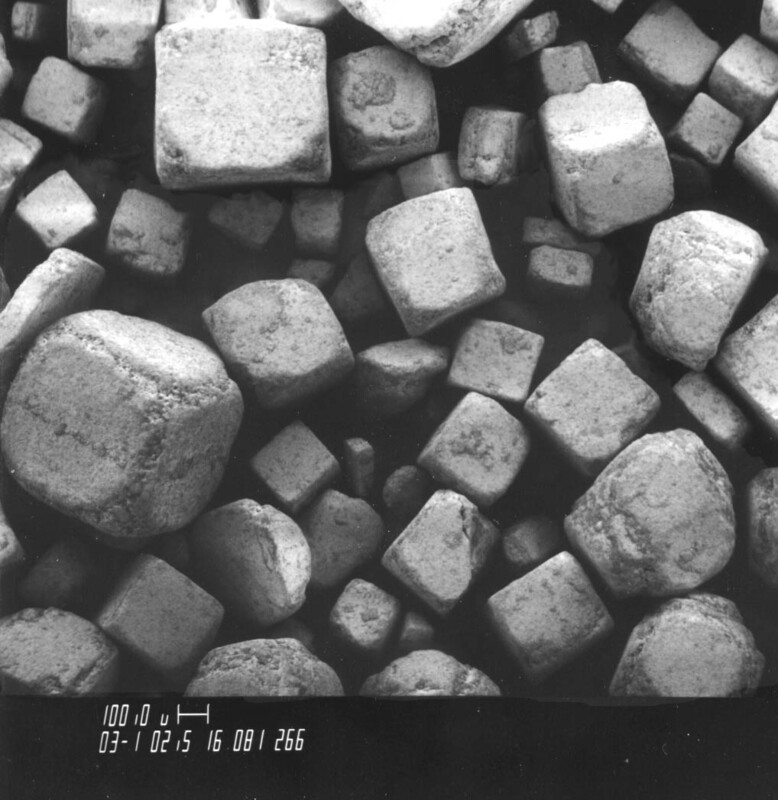 This is a seondary electron image of iron oxide crystals. Looks remarkably like a sea urchin. End grain view of a broken wooden pencil. Lady Bug, belly up, head to about mid-body. 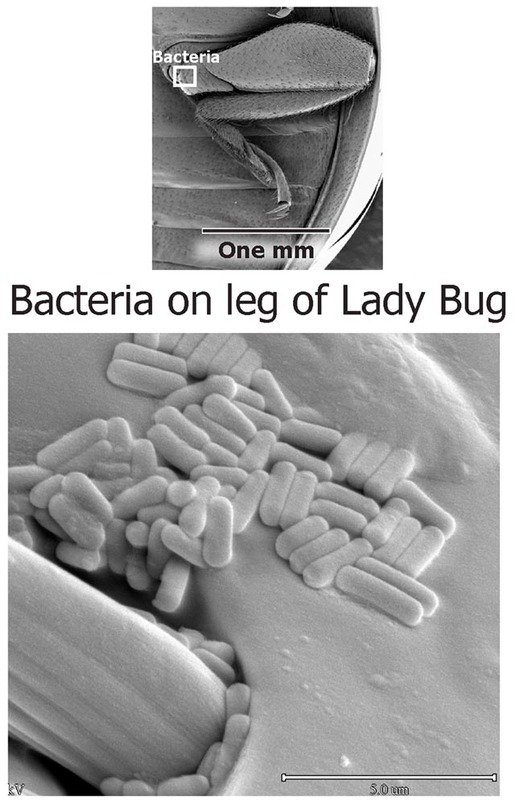 A view of bacteria living on the Lady Bug. A zoom-in series on Bread Mold. 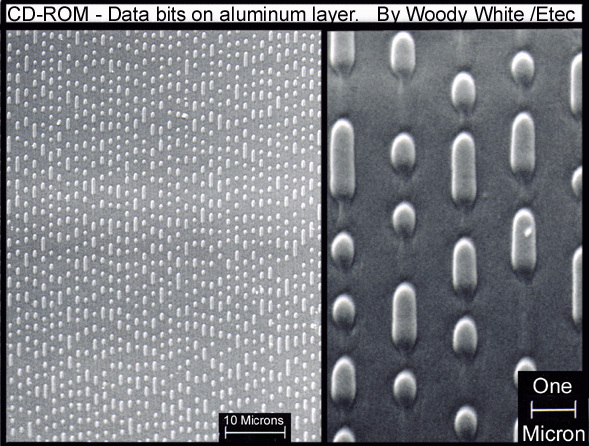 CD-ROM data as seen by the SEM. Plastic removed to view aluminum layer. 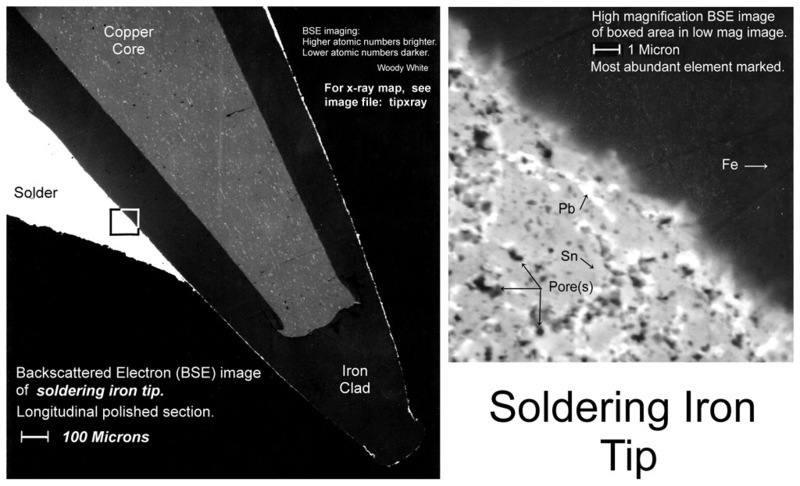 Soldering Iron tip, polished section/ BSE (composition) imaging mode. 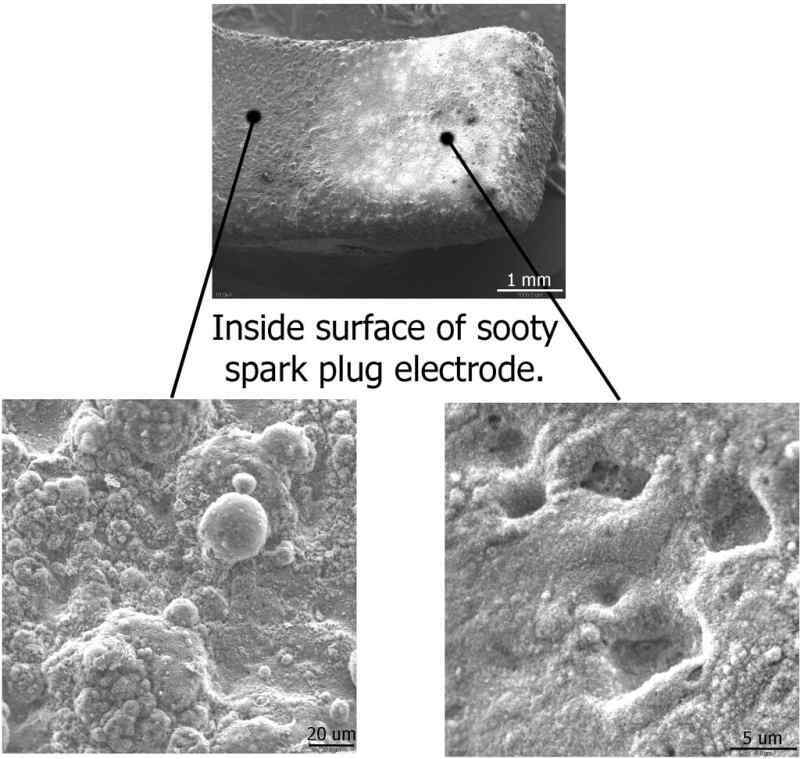 Soldering Iron tip, elemental distribution x-ray "maps" of above image. A filling from my (lousy) teeth. No chemical attack - Sure! 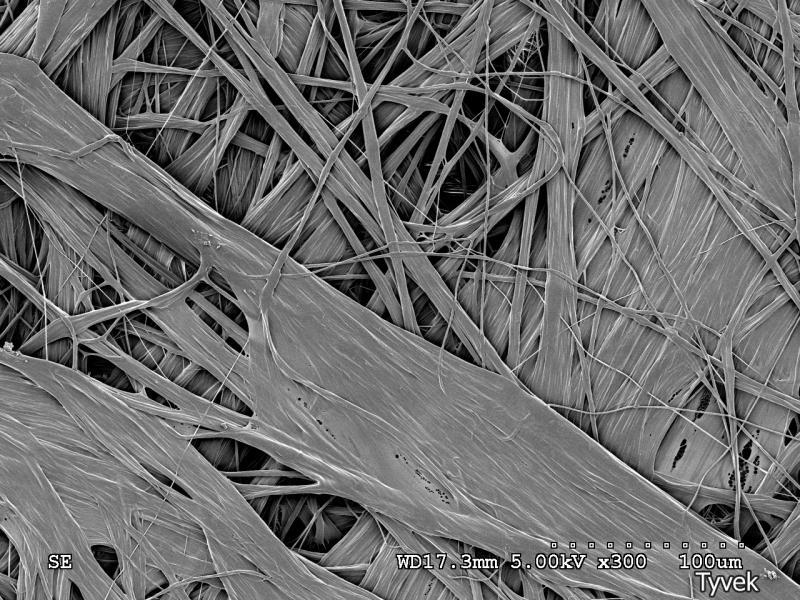 Molybdenum Disulfide, flakes. 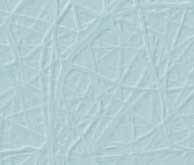 Used in lubricants and anti-sieze compounds. Outdoor air sample (2) on filter. 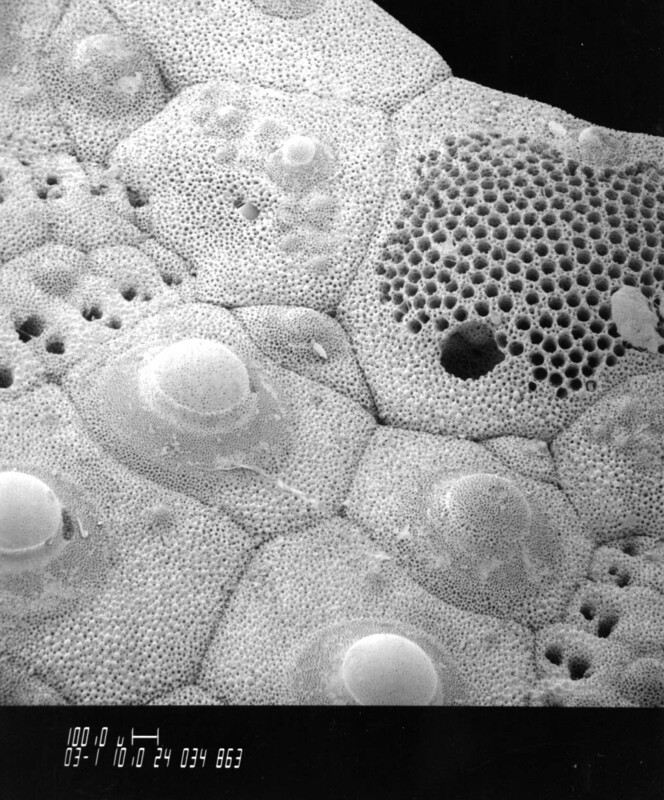 Interesting pollen grain??? 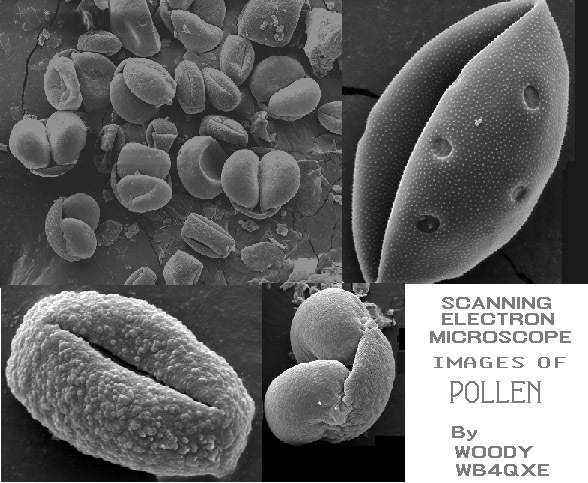 Various views of pollen collected locally. A plant leaf - Known sometimes as "Hunter's Friend or "Rabbit Tobacco". Formal name?? 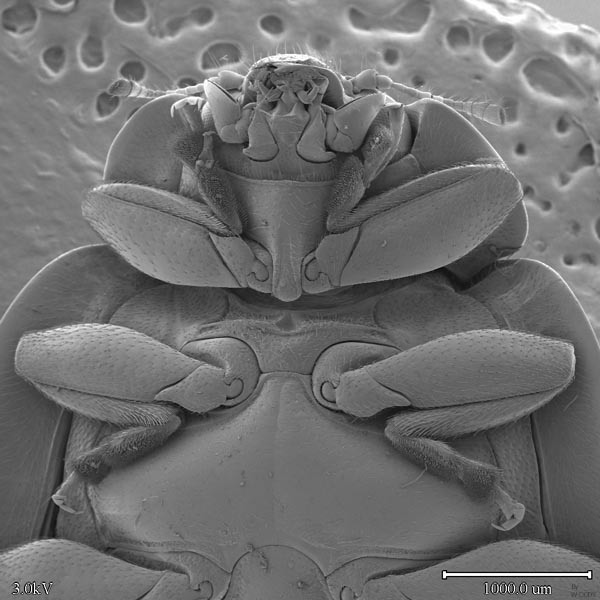 The foot of a common house fly. 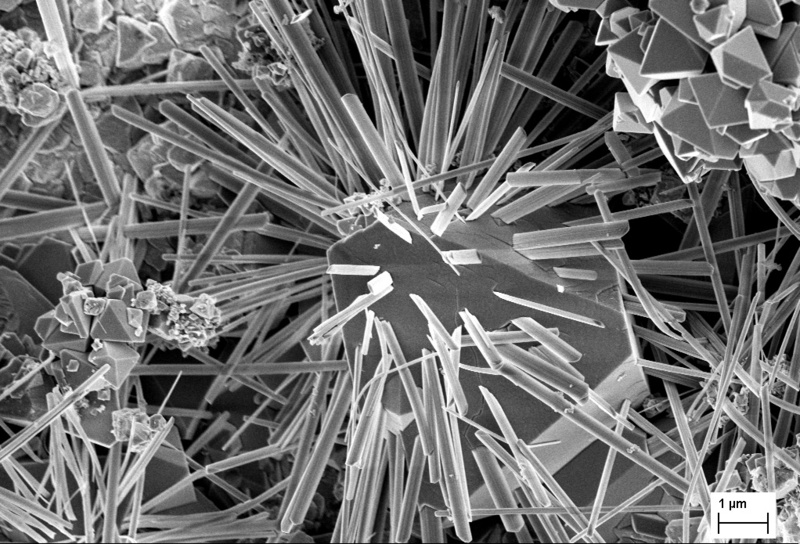 Rhenium metal crystals growing on a surface. A 741 op-amp IC, internal construction and partial view of die. 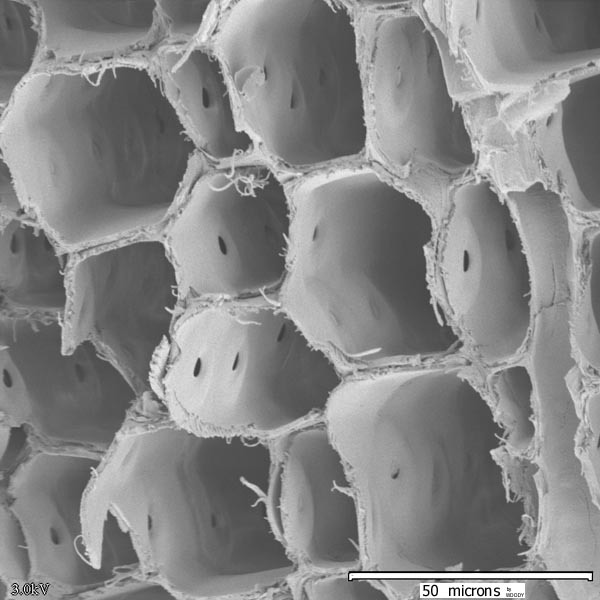 A partial view of a sea urchin shell. 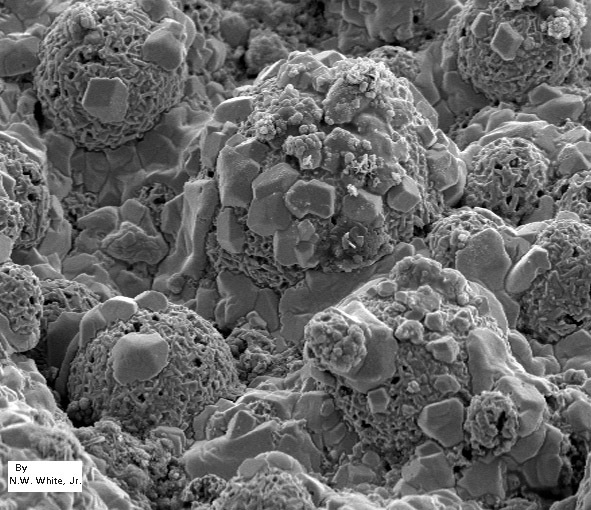 Alloy precipitates in a superalloy weld void. 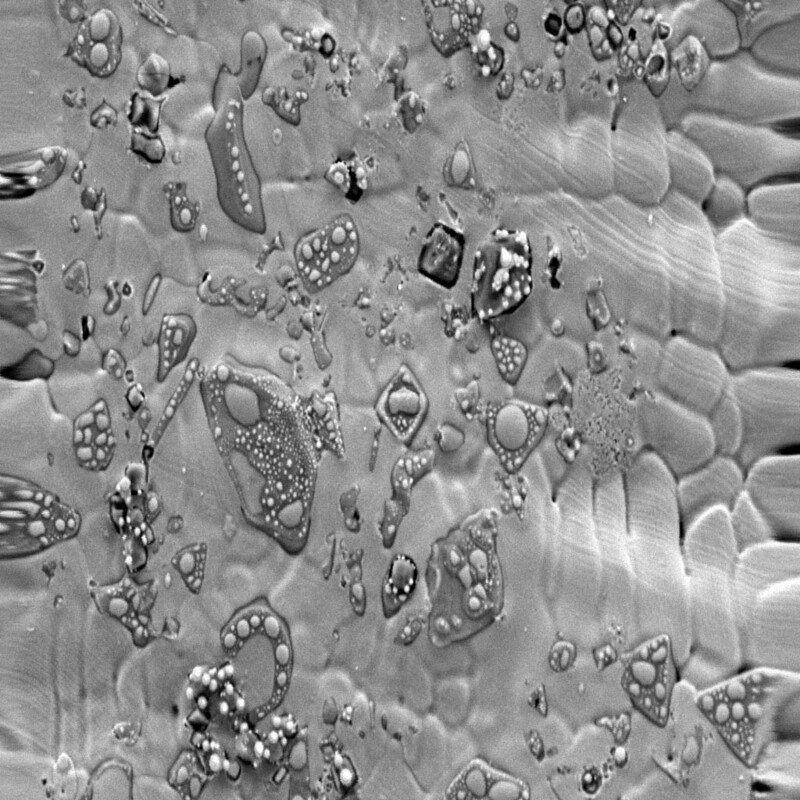 Backscatter Image. 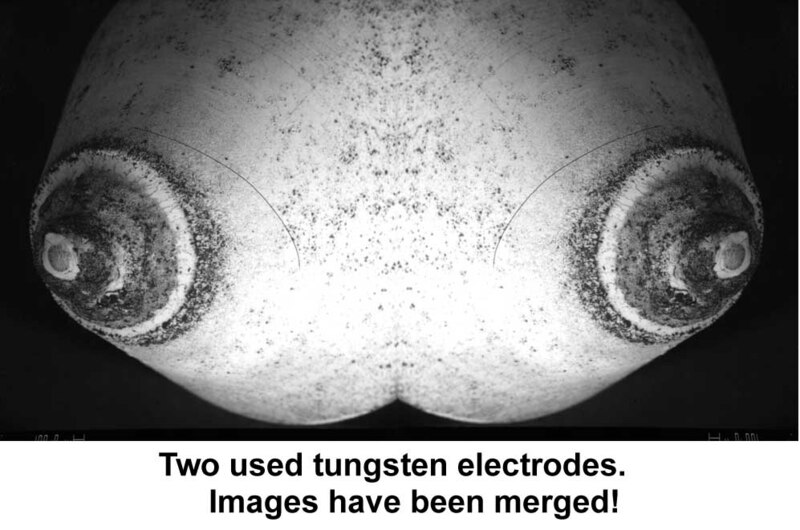 ( Sort of an "adult" image ;) Used welding electrode. Two images merged. Please email me if you have any problems with this page.